Google have summarised the top trending stories of the year in a nifty doodle which includes some of the biggest stories of the year. Now that 2014 is drawing to a close it is a good time to take a look at the news items that were trending at one time or another during the year. Early in 2014, Flappy Bird was the game that had everybody addicted with eyes firmly fixed on their phone screens. The main character makes its' way across the iconic Google logo to kick off the animated doodle. Flappy Bird then quickly transforms into a football in a nod to a hugely successful 2014 World Cup finals which was held in Brazil, the home of football, over the summer. The L in Google then kicks the ball up onto the top of the E and the word transforms to be replaced by '2014'. Next up for honourable mention via animation is the Rosetta space mission as Rosetta is seen blasting out of the 1 and it's Philae lander touches down on the 0, which is in the shape of a comet, shortly afterwards. And to round off the creative doodle, 2014 would not be complete without the ALS Ice Bucket Challenge and the 2 gets drenched by an icy bucket of water and shakes with the cold. 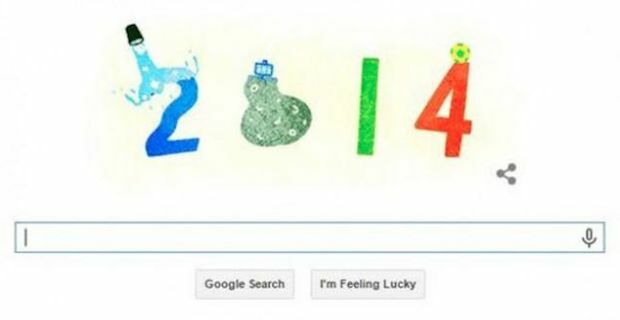 The Google doodle also allows browsers to click on it to get a more detailed list of trending topics from 2014. You can search by country or simply check out the top trending topics globally and it makes for a nice way to round out 2014 by reminding yourself what caught everybody's attention this past year.